Anita was serving tea on a small balcony. Because it's now or never. Are you saying they will never reach heaven? Those are harsh words for you, Anita. What is unreachable is right where you are. There's nowhere to go if you're already there. With a silent grunt at every step. Were you in heaven then? Friend. Her voice was gentle. And imagined a mouth with a silent cry. God is my substance, my joy, my life. My mind was not where you were looking. Did an all-loving God cause that accident to you? Those fractures in your vertebrae? What is your answer to that? Look! There's a hawk circling above us. 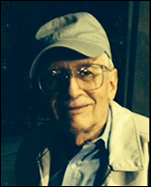 Irwin Goldman is a member of the Hamilton Poets (a.k.a. Full Bloom Poets) at Project Find in New York City.